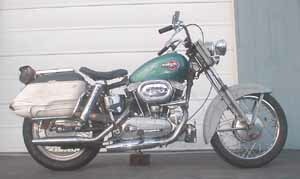 This site will publish and share design, repair and style information on Harley Sportsters form 1957 to 1884. It is in no way associated with the Harley Davidson Motor Company, its management or its employees. My friend Karen showed my some old Buco antique saddlebags she was restoring and mounting on her 74 Sportster. I tried to get her to sell them to me but no dice. That night I looked on E-bay and in a modern miracle a fellow down in Arkansas was selling a pair he had on an old Honda Dream. I mounted then on my trusty old 62 Sportster. I needed to mount an old Voltpak style regulator on the end of a generator. I whipped this bracket out in a few minutes. Not only that, I still have all my fingers. My 1977 Sportster keeps breaking the side stand bracket. Maybe this fix will last. My '96 developed a leaky primary cover at only 12,000 miles. Here is the fix. Mounting a set of '60s vintage Buco aftermarket saddlebags to a 1962 Sportster. For Netscape: Open "Files/Page Setup". Uncheck all boxes. Set margins to 0. Open "Files/Print". Set print range form 1 to 1 in order to suppress the printing of this instruction box. Open "Files/Print Preview" to se what the page will look like. Netscape will generally print the colored sections and reverse text. For Explorer: Open "Files/Page Setup". Clear contents of header and footer box. Set margins to 0. Windows will default values back to minimum possible with your printer (i.e. 0.213). You can open "Files/Print Preview to see what page will look like. Open "Files/Print" and set range from 1 to 1 in order to suppress the printing of this instruction box. Explorer will convert all colored backgrounds to white and all text to black. Once again, geeks trying to do your thinking rather then doing your work. Aren't you glad you hate Microsoft? Don't you wish everyone did? Our Guarantee: No Frames, no Java, no Swift C, no cookies, no cascading style sheets, no dot net monopoly bully and no Active Server Pages. Minimal graphics and no audio without request. Most documents in this site are available on pdf format and those will have full graphics content. We also make the source documents available whether Excel or Word or Autocad. We believe engineering and technology are an art. Free sharing and expression are more important than small-minded monopoly rent seeking. Feel free to use the files and materials on this site. Good luck with your projects. Copy any content and distribute freely with credits given.